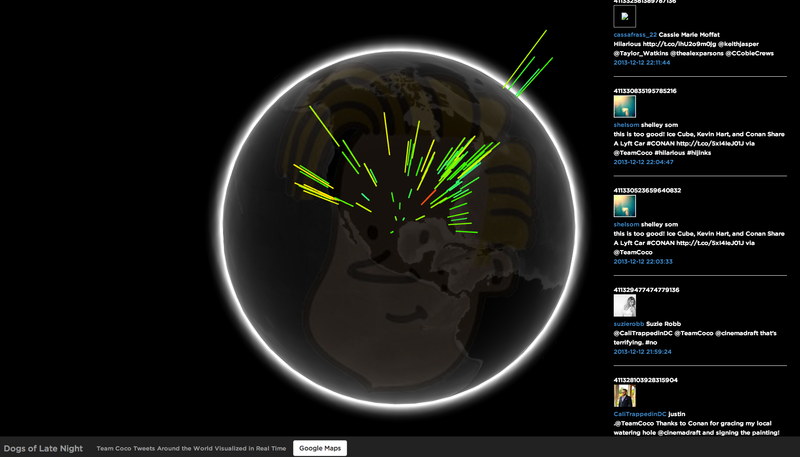 Visualizing geotagged hashtags or key phrases is cool. I’ve used Twitter’s REST API before, but I have long wanted an excuse to learn how to use the streaming API so I could mine real time data. Some things I learned about the STREAMING API vs the SEARCH API is that you can look for the presence of words but not exact phrases. The streaming API fails sometimes (usually on Saturdays after a code push by Twitter HQ), so be prepared to restart your background processes or have a fallback plan in place. Depending on what search terms you’re looking for, you may not find a lot of geotagged tweets as users have to opt in to share their location. In my app I render tweets from December 2013 to present day, because my keywords are so niche. I have a tablet (Playbook) embedded in an Arduino installation which supports both versions of this web app. Dogs of Late Night Arduino Installation – Real Time #TeamCoco Geotagged Tweets Visualized in 2D and 3D (WebGL) from insultcomicdog on Vimeo.